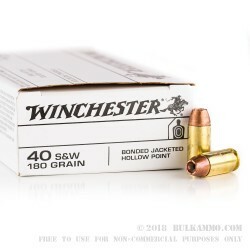 An excellent deal on Winchester’s Bonded 40 cal Hollow point that utilizes the 180 grain 6-petal hollow point projectile and offers excellent penetration and extreme weight retention. For a round so inexpensive this is a legitimate carry option. The actual performance in gelatin testing and reliability wise is in the top tier. 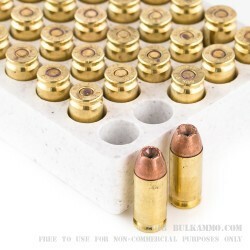 The Reloadable brass casing makes it interesting too, for reloaders. The 985 velocity (feet per second) and the 388 ft. lbs. of energy are lower than the stated numbers for the ultra-premium rounds in this category, but the slightly diminished numbers (in many cases less than 1% difference) don’t seem to affect this Winchester load when it comes to the actual performance of the bonded JHP. The lack of case separation means a bigger wound channel and a harder single shot performance. 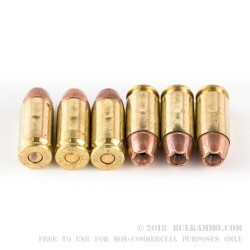 For the money you’d be hard pressed to find a more reliably expanding round or one that can penetrate with the same consistency level that this (arguably) bargain priced duty round can. Sometimes the numbers on the box mean very little when it comes down to actually bringing out the performance of a particular load. 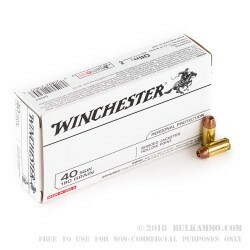 These Winchester duty rounds are a perfect example of that concept.